Heating Paramount Air Conditioning Heat Pump Thermostat W.R. Smith, Inc.
Q: Why should I replace my existing heating or air conditioning system? A: You may wish to consider replacing your air conditioning or heating system if it is old, inefficient or in need of repair. Today's systems are as much as 60% more efficient than those systems manufactured as little as ten years ago. In addition, if not properly maintained, wear and tear on a system can reduce the actual or realized efficiency of the system. If you are concerned about utility bills or are faced with an expensive repair, you may want to consider replacing your system rather than enduring another costly season or paying to replace an expensive component. The utility cost savings of a new unit may provide an attractive return on your investment. If you plan on financing the purchase, the monthly savings on your utility bill should be considered when determining the actual monthly cost of replacing a system. The offsetting savings may permit you to purchase a more efficient system. Q: How do I select the right heating/cooling system? A: First, make sure the unit is properly sized. Your York dealer will provide a load calculation for your home. Also ask the dealer to provide an energy analysis to determine operating cost. Next, consider any comfort issues in the home. Some products can reduce air stratification and uneven temperatures from room to room. If you have allergies, an indoor unit with an ECM motor will allow you to circulate the air in your home continuously while filtering the air for about the same cost as operating a standard light bulb. Finally, know your budget parameters and the efficiency of the system being proposed. Does the system offer a payback? In other words, will the monthly savings over time offset the cost of the new unit or efficiency option being considered? Q: What is involved in replacing an old system? A: Aside from the placement of the new equipment, your York dealer will inspect several items and make a determination of whether or not these items need to be supplied or replaced. Some of the items include: ductwork, insulation, refrigerant piping, electrical service, wiring, thermostat, condensate piping, flue piping, flue terminations, chimney liner, slabs, filter, driers, registers, grills, drain pans and evaporator coil. Q: What is involved in installing a new system? A: If a system is being added to the home for the first time, most of the items noted in the previous question and answer may be required to install the new system. Besides the equipment, the most significant component is ductwork. The ductwork can be either metal or fiberglass ductwork. The ductwork needs to be properly sized to deliver the right amount of air to each room. 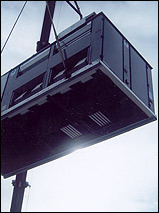 The ductwork consists of supply and return ductwork. The supply duct is attached to the outlet of the furnace or air handler and delivers air to individual zones in your home. Your York dealer will determine the size of the ductwork going into a space by the amount of air that needs to be delivered to the space. Tuning up the distribution side of a forced-air system starts with the blower. The axle should be lubricated, blades cleaned and lower motor checked to insure the unit isn't being overloaded. The fan belt should be adjusted so it deflects no more than an inch when pressed. Every accessible joint in the ductwork should be sealed with mastic or UL-approved duct tapes. Any ducts that run outside the heated space should be insulated. On a hot-water system, the expansion tank should be drained, the circulating pump cleaned and lubricated and air bled out of the radiators. Most houses with forced-air furnaces have a standard furnace filter made from loosely woven spun-glass fibers designed to keep it and its ductwork clean. Unfortunately, they don't improve indoor air quality. That takes a media filter, which sits in between the main return duct and the blower cabinet. Made of a deeply pleated, paper-like material, media filters are at least seven times better than a standard filter at removing dust and other particles. An upgrade to a pleated media filter will cleanse the air of everything from insecticide dust to flu viruses. Compressed, media filters are usually no wider than six inches, but the pleated material can cover up to 75 square feet when stretched out. This increased area of filtration accounts for the filter's long life, which can exceed two years. The only drawback to a media filter is its tight weave, which can restrict a furnace's ability to blow air through the house. To insure a steady, strong airflow through the house, choose a filter that matches your blower's capacity. Q: Where do I get replacement parts? A: Contact your York dealer for help obtaining replacement parts. Q: What is covered in my warranty? A: All York products come with a written limited warranty on parts. This warranty states that a replacement part will be furnished for any part of the product that fails in normal use and service during the applicable warranty period specified in accordance with the warranty's terms. Your authorized York dealer can review with you the warranty periods for the products you select.